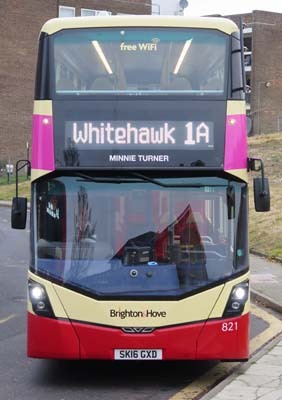 Connections with Brighton and Hove : Minnie Turner, born in Preston Street Brighton, became a leading campaigner for women to get the vote. Born in 1867, she ran a guest house in Victoria Road early last century which attracted many professional women. She joined the Liberals but left because of their poor support for women’s suffrage. Then she turned to militancy and was arrested three times. Once she broke a window at the Home Office in London and was sent to prison. By 1913, the guest house had acquired a mixed reputation locally as a “suffragette centre harbouring a colony of militants”. In April 1913, the windows of the house were stoned by local youths. Minnie Turner and her guests retaliated by sticking up signs in the windows declaring the damage an illustration of “Masculine Logic - the only kind of argument men understand”. In later years she was modest about her achievements, but proud of the many suffrage leaders who had stayed with her at Victoria Road. Her guests had included Mrs Pankhurst and several of her family, Lady Constance Lytton, Lady Emmeline Pethick-Lawrence, Emily Wilding Davison, Annie Kenney, Mrs Drummond and many others. The guest-house was often full, and extra accommodation was arranged in the form of a wooden hut in the garden and even a potting shed-type annexe. She also joined the Brighton Board of Guardians and helped improve conditions in the workhouse at Elm Grove. 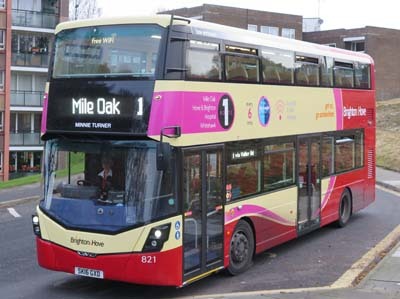 821 Mercedes Streetdeck on Route 1 - carried name since December 2016.